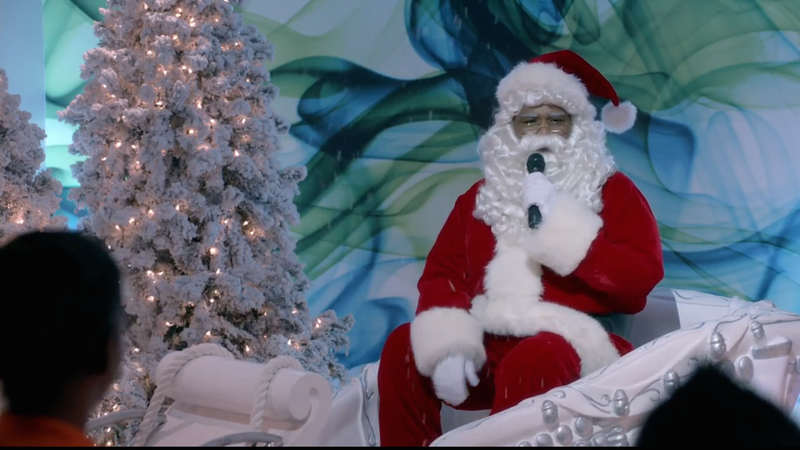 On Wednesday night, Black-ish aired its requisite Christmas episode, the fall finale, which featured Andre (Anthony Anderson) campaigning to be the first Black Santa for his annual office party. One of the show's simple, burdensome tasks as a Black family sitcom that also directly tackles race is to merely succeed. In its first-half run, it's found creative ways to make good, interesting (albeit flawed) TV out of typical storylines. For all its intended boundary-breaking, Black-ish still has to play by the family rules, which means lots of sitcom tropes. Of the initial 10 episodes, there's been a Punishment Episode, The Talk, a Crazy Mom Episode, Babysitting Episode and a Halloween Special (doubling as the Prank Episode), all of which did well at flipping cliché scenarios into funny commentaries from a modern Black family's perspective. Because so many family sitcom tropes in recent years have only tailored to the white American experience, seeing some version of a Black story—in a way that highlights both the normalcy and the differences in Black family units—has been satisfying. For Black-ish, the pickup comes after an encouraging Week 3 rating uptick last night as the family comedy also logged the best-ever viewer retention out of Modern Family for any comedy debut. Last night's Christmas episode, "Black Santa/White Christmas," opened with a montage of the family celebrating past Christmases—in one flashback, Dre's mom (played by Jenifer Lewis) tells a young Dre, "You think some fat white man showed up on Jesus' birthday and gave you those full-priced socks? Ha! I don't think so." Then comes the unfortunate death of Fred, Dre's coworker who dressed as Santa every year at the Stevens & Lido holiday party. His passing opens the door for a successor and Dre wants the job. When Dre tells his kids about his dream of being Black Santa, Jack says, "We'll still get our presents from the real Santa right? The white one?" While campaigning for the Santa gig, Dre says, "The White House was just that—white—until one man broke through and gave my people hope." And it's Dennis Haybert from 24. After Dre loses the gig to a Mexican woman, he tells his mom and his wife Rainbow (Tracee Ellis Ross), "There's supposed to be a Black Santa before a Mexican Santa." His mom agrees, saying, "Mexicans can't be jumping the line. It's bad enough they started taking Black people's jobs with sneaky tricks like working hard for less pay." In context, this conversation about Mexicans versus Blacks is bold for a primetime family show, although they're had all the time in real life and on social networks. This is one of the mildly frustrating things about Black-ish—that it has to play catch up on jokes that have already been made. It's like watching a live stand-up comedian who's never on Twitter. Episode 6, "The Prank King" features a funny exchange between Dre and his oddball work friend Charlie about how all black people know each other. Charlie somehow knows RuPaul. When that same episode ends with the family dressed as the Jackson 5 strutting to "The Love You Save," I screamed. The music of Black-ish has been a major source of comfort. Though Black-ish hasn't strayed much from the family formula, it's at least done a good job giving our inside jokes a platform, with relevant social commentary and pop culture references. Often, it's been subtle. In Episode 8—Crazy Mom Episode—Jenifer Lewis, as Dre's mother, gives an unofficial lesson in shade (in-laws are masters at it) in her scenes with Rainbow. While visiting the family, she asks Rainbow: "Did you do something around your eyes? You look less tired." Rainbow calls them "passive aggressive jabs." In Episode 9, "Colored Commentary," Rainbow gets upset about an announcer for Jack's Little League who seems to be making racist comments about Jack (i.e. about "stealing") during his games. Dre references the race card as "African American Express," which, thank you Kanye. "We wanted to go away from that stereotypical ditzy teenager. We wanted to make Zoey sort of detached, almost like her parents were a nuisance to her. Her family's like an accessory that she has to wear, but she hates that bracelet. We wanted her to be beautiful and popular; we also wanted to make her the kid that, more so than all the other kids, was seamlessly fitting into this world that Dre, her father, was having such a hard time understanding. She never had an awkward stage. She automatically was popular." The sibling dynamic is totally believable. Barris referred to the youngest daughter, Diane, as "sort of the mastermind, and oftentimes she's a little ahead even of the parents. We kind of feel like we've developed a small sociopath genius—she has this part of her that you're a little scared of. Like, 'This person grows up to be president, or Hannibal Lecter.'" According to Deadline, Jonathan Groff is replacing Wilmore as showrunner for the second half. (Wilmore is leaving to host his own spin-off of The Daily Show.) I can't say Black-ish has been deeply satisfying, but I'm entertained and invested in it, and I'm anxious to see how it matures.